What you gonna do when the rain floods down? Well for a change we’re not talking water-proofs, rain jackets or even sou’westers :- Not a clothing advert in sight, we’re talking floods! 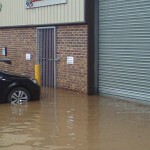 Saturday 18th saw ridiculous amounts of rain fall in a short time & as a consequence we found ourselves under water. Now by “ridiculous amounts” I’m talking a river that rose by 8 to 9 feet with the final 3 foot that burst the banks & flooded the estate in an hour! The downside is that the last 2 weeks have been a bit of a nightmare; We’ve had to bin & re-do thousands of pounds worth of customer orders – Thank you to everyone for their patience & understanding. We’ve relocated to new premises: 51 High Street, Wigton, Cumbria, CA7 9NJ however the phone numbers all stay the same & you can reach us via the website as normal. Thankfully we’re now back in production, but only at a reduced level however it’s likely we’ll have no shop display for at least 3 weeks. Still, the good news is we’re still in business! 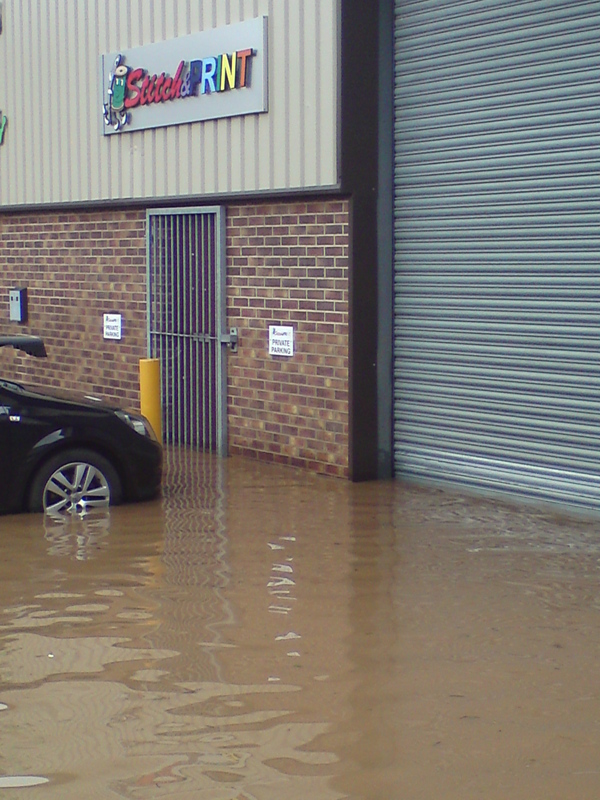 This entry was posted in Latest News, Stitch & Print and tagged Cumbria, flood, relocation, Wigton, workwear on 31st May 2013 by admin.